Battery pack: 7 Sub-C type NiCd cells, in 1997: max. weight: 425 g.
Wing Loading: 7.5 kg/m² (max.). 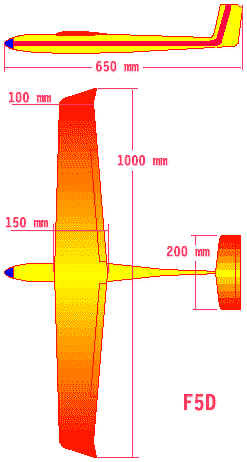 A typical F5D pylon racing model (1996). Graupner Race Rat 1000 ? ? Mini Viper 770 ? ?